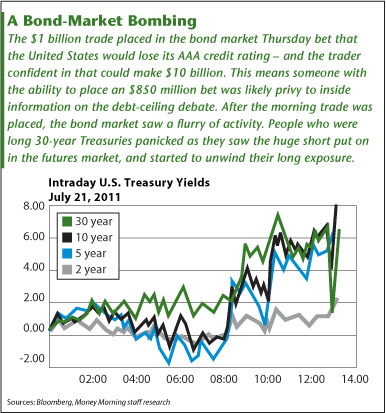 Jack Barnes: Someone dropped a bomb on the bond market Thursday – a $1 billion Armageddon trade betting the United States will lose its AAA credit rating. This means someone is confident that the United States is either going to default or is going to lose its AAA rating. That someone is willing to bet the proverbial farm that U.S. interest rates will be going up.I believe what happened is a debt-ceiling deal was done in Washington and leaked to a major proprietary trader. Everyone knows the debt negotiations in Washington have been an extreme game of brinksmanship between political parties, but now someone knows how that game played out.This had the hallmarks of one of the largest bond shops in the world knowing something the rest of the market didn’t. The number of shops or even central banks that can take on this level of market risk is extremely small. Some that come to mind are hedge fund manager John Paulson, Bill Gross’s PIMCO, and the U.S. and Chinese central banks. Paulson already scored big – about $6 billion big – on a similar trade years ago when he bet against subprime mortgages, the investments that helped bring down Lehman Bros. and many other investors. Whoever was behind it wanted a trade on ASAP, and didn’t care about the ripples they would cause. You can see how this trade caused fear to be unleashed in the market once it got out and the implications hit by looking at U.S. Treasuries. People who were long 30-year Treasuries panicked as they saw the huge short put on the futures market, and started to unwind their long exposure. What you, as investors, should do now is look at the bond exchange-traded funds (ETFs) that provide a positive rate of return when U.S. Treasuries drop in value. Yields are going up sooner rather than later, if the person behind this Armageddon trade is correct. We’re in the midst of the greatest investing boom in almost 60 years. And rest assured – this boom is not about to end anytime soon. You see, the flattening of the world continues to spawn new markets worth trillions of dollars; new customers that measure in the billions; an insatiable global demand for basic resources that’s growing exponentially ; and a technological revolution even in the most distant markets on the planet. And Money Morning is here to help investors profit handsomely on this seismic shift in the global economy. In fact, we believe this is where the only real fortunes will be made in the months and years to come.